At Intech, we often hear from customers inquiring about what they should look for in spray foam insulation machines. Of course, there are the more visible, physical characteristics to consider, including pump drive type, output, pressure rating, heating capacity, and electrical system. However, we believe your SPF equipment distributor’s level of customer service is equally important. Does Your Spray Foam Insulation Machine Provider Boast a Nationwide Footprint? One thing to think about when it comes to what to look for in spray foam insulation machines is whether a distributor boasts a nationwide footprint. SPF machine part after 5 p.m. At Intech, one of our West Coast agents can ship that part through FedEx by 10:30 a.m. the very next day, depending on FedEx’s availability. The impact and reach we have as a nationwide SPF equipment provider is second to none. With locations across the U.S., we efficiently deliver parts anywhere in the country by the next day. Does Your Spray Foam Insulation Machine Provider Leave Out Warranties and Coverage? If you purchased your equipment from Intech’s store with a warranty, we will fix or replace it. We stand behind our products and will fix or replace any parts as quickly as possible. Does Your Spray Foam Insulation Machine Provider Offer Same-Day or Next-Day Customer Service? Many SPF equipment providers sell parts, but the truth is that they do not always provide the expert knowledge and service to back up their smooth sales pitch. At Intech, we offer same-day and next day service, as well as troubleshooting. These services are available either in person or via phone, across three time zones. With our easily accessible team of experts, there is no red tape to navigate through. We ship parts quickly, and our customer service reps will efficiently walk you through questions or repairing a spray foam insulation machine over the phone the same day. Or, should your issue require in-person assistance, we will send technicians out to your location within one day. At Intech, we have been serving the spray foam industry for more than 20 years. That successful track record gives our customers peace of mind that our company will still be around when you need us most. We are committed to supporting customers with their first purchase, throughout the ownership of the equipment, and into the future. 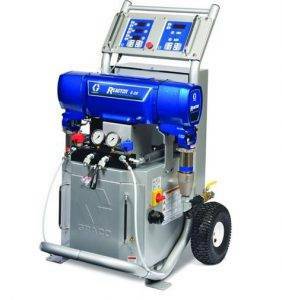 Ready to look at available models of spray foam insulation machines? Visit our sprayfoam equipment store or contact us with questions. Copyright © 2019 Intech Equipment & Supply. All Rights Reserved.